Commission on Election launches ‘I-rehistro’, an online system that gives the voters the chance to get registered via online. According to COMELEC Commissioner Luie Guia, voters need not to worry for their security of their information that they type in the online registration form.. They assumed it is secured since there is no problem reported to them until now. The online service is put up to address the yearly problem on validation and registration. Every year vast number of voters go the the COMELEC offices to get registered and validated. 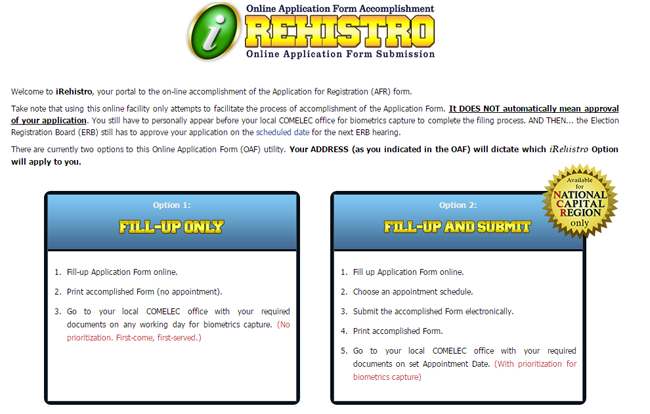 I- rehistro is yet to be expanded as it can only cater for those who live in NCR as of the moment. The COMELEC plans to make it available to the whole country. As for the overseas absentee voters, the system is already available for those in Spain, Madrid. After registering online, voters must still go the the COMELEC office assigned to their community area to register their biometric data and photo. Though registered through the online system but was unable to register the biometrics data, the voter will be unable to vote. As cited by the COMELEC, the the number of registered voter without biometrics went down to 6 million from 9 million. The big difference is enough to affect the election results.